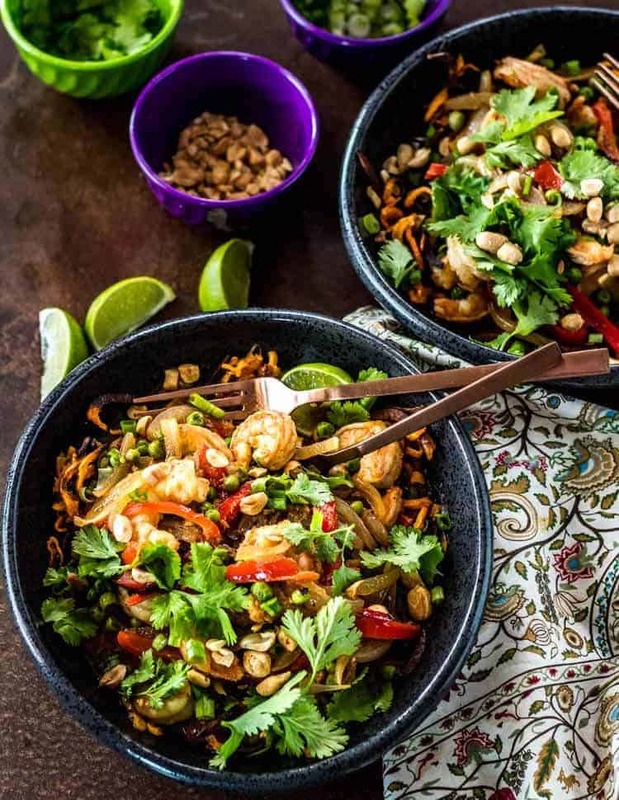 A modern twist on a Thai classic, Thai Sweet Potato Noodle Bowls with Shrimp and Peas start with a crispy, spiralized, and roasted sweet potato base, and get topped with a flavorful Thai coconut curry sauce full of shrimp and vegetables, and garnished with fresh herbs, scallions, and peanuts! It’s low carb, gluten free, and delicious! All that to say… I. USE. MY. SPIRALIZER! It is lightweight, doesn’t take up much space, and easy to clean (just ask Mark!). As I’ve mentioned before, hubby and I are trying to lose the “middle-age creep” pounds that snuck up on us in recent years. Reducing carbs does seem to help. I find the spiralizer is a “go to” for low carb mains and sides. Think Low Carb Groundnut Stew with Chicken and Spiralized Sweet Potatoes, 15 Minute Shrimp Zoodles, Greek Zoodle Salad, Spiralized Beets with Toasted Walnuts, Bleu Cheese, and Sage, and Quick Spiralized Root Vegetables. The sauce base is a massaman curry – a relatively mild curry with galangal, ginger, lemongrass, shallots, turmeric, cardamom, cinnamon, cloves, cumin, nutmeg, etc. I love the flavor profile with shrimp. Of course I love to make my own massaman curry paste, but I’ve been known to keep a tub of commercially prepared curry paste in my refrigerator. 🙂 The choice is yours! AND. REMEMBER. BE FLEXIBLE! If you can’t find (or don’t like) massaman curry, you can substitute green (green chile and herb base), red (red chile emphasis with the addition of fish paste), yellow (turmeric, cumin, yellow mustard seed and quite mild), or panang (similar to red but milder and with peanuts). 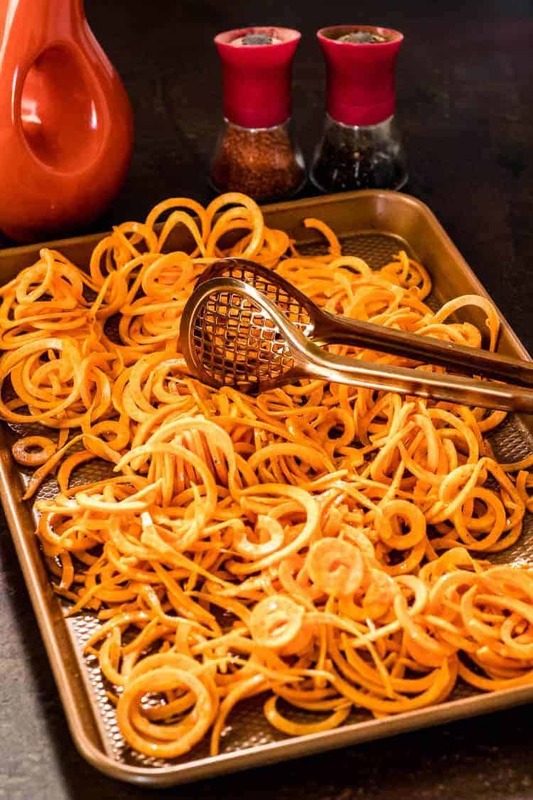 The spiralized sweet potatoes get tossed with some olive oil, sea salt, and fresh ground pepper, and roasted. Those crispy, tender edges make a great base for the shrimp and pea curry sauce. While the sweet potatoes roast, prep the shrimp and garnishes. Only then will you start the sauce. You only want to cook the shrimp for a few minutes (unless you are into eating “shoe leather”). You can finish the sauce, and plan on cooking the shrimp about 5-6 minutes in the sauce prior to plating. Lastly, you’ll plate the spiralized and roasted sweet potatoes, ladle over the massaman shrimp and peas curry, and garnish as desired. 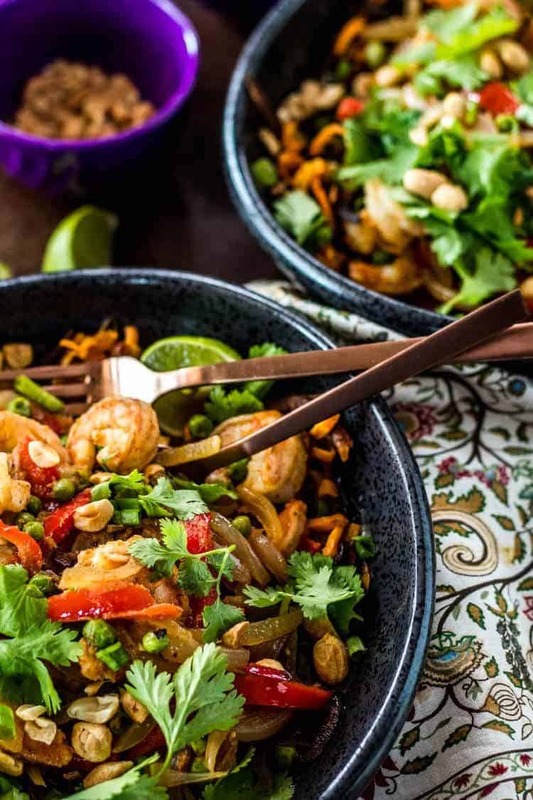 Given that the sweet potatoes take only 20-25 minutes, you ought to be able to have Thai Sweet Potato Noodle Bowls with Shrimp and Peas on the table looking mighty fine in about 30 minutes! What are you waiting for? 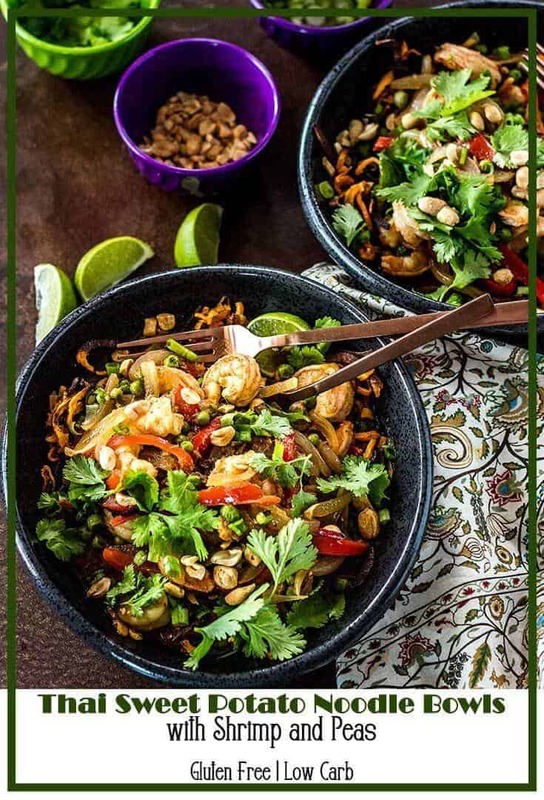 A modern twist on a Thai classic, Thai Sweet Potato Noodle Bowls with Shrimp and Peas start with a crispy, spiralized and roasted sweet potato base, and get topped with a flavorful Thai coconut curry sauce full of shrimp and vegetables, and garnished with fresh herbs, scallions, and cashews! It's low carb, gluten free, and delicious! Spiralize the sweet potatoes. Toss with a generous drizzle of olive oil, sea salt, and fresh ground pepper. Spread them out on a sheet pan. Roast 20-25 minutes until many of the edges are browning, tossing after about 10 minutes. While the sweet potatoes roast, make the curry. To a wok over medium-high heat, add the oil. When the oil is hot, add the onion, garlic, and ginger. Stir fry until fragrant and onion is transparent (not browned). Add the pepper strips, and stir fry an additional 1-2 minutes. Whisk together the curry paste, coconut milk, sugar, and lime zest and juice. Add to the wok/pan. Add the shrimp and peas, stirring frequently. Cook just until the shrimp turn pink, being careful to not overcook them! Remove from the heat. Using tongs, divide the sweet potato "noodles" between shallow bowls. 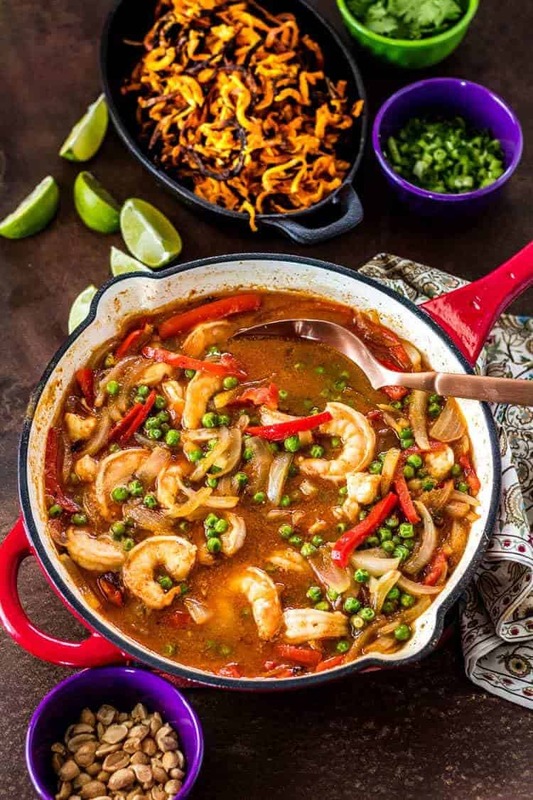 Ladle the shrimp and pea curry over top. Garnish as desired. Enjoy! I look for chubby sweet potatoes (with a relatively large diameter). Cut off enough of each end to provide a flat spot. Spiralize. I specify 2 large sweet potatoes for me and my husband as they shrink down as they roast. We never have leftovers, but if you do, you can certainly reheat them. They will, of course, lose the crispy texture. 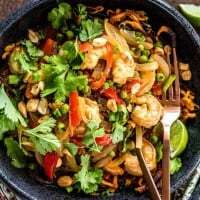 I specify massaman curry paste, but as I mentioned in the post, you can substitute one of the other Thai curry pastes. Massaman Curry Paste or a homemade yellow curry paste.